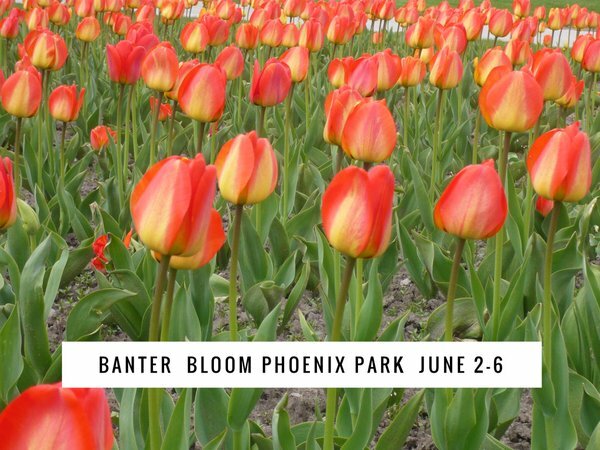 This whole Banter shebang has taken me to some fascinating spots over the last six or seven years and last year’s run of talks, interviews and discussions at the Bloom festival in Dublin’s Phoenix Park was easily one of the highlights to date. It’s a huge family-friendly festival, pulling in around 100,000 people over the course of the June bank holiday weekend, and they’re there for a bit of everything, from show gardens and flower exhibitions to trade shows and what-have-you. Banter, it’s safe to say, is firmly in the what-have-you category. Here’s the full rundown of who we’ll we talking to at Bloom this year and what we’ll be talking about – as you can see, it runs the waterfront from food, farming, gardens and wildlife to social issues, technology, health, history and retail. You’ll find the Banter tent located in the middle of Food Village at the festival (it’s number 27 on this map). Bloom is about more than just about what’s happening in the Phoenix Park. Marion Keogh and Róisín de Buitléar talk about Bloom Fringe and its workshops, talks, installations, pop-ups, art and demos on the streets of the capital. In April, 1.5 million people tuned into RTE’s Big Week On the Farm show. We talk to John Fagan, the man whose Co Westmeath farm became the all-action site for the show, about what was involved. Farmers Journal editor Justin McCarthy joins us at Banter to talk about his work at the paper and how to keep its readers happy in a challenging and changing world. How do food stores decide which artisan or new producers they’ll stock? We’ve brought together a number of food buyers from major outlets – Aoife Ryan from Retail In Motion, Diarmuid Murphy and James Watson from Dunnes Stores and Derek Murphy from Topaz – to talk about what they look for when they decide to put a new product on their shelves or menus. Niamh Bushnell is the first ever Dublin Commissioner for Startups. We’ll hear about her role and why Dublin and Ireland are proving to be a healthy breeding ground for new technology companies of all kinds. 4.30pm – What’s next for the food service sector? They’re back! David and Stephen Flynn from The Happy Pear return to the Banter at Bloom tent to talk about their new book The World of the Happy Pear and their mission when it comes to food. You won’t read a better memoir all year than Patrick Deeley’s account of growing up on a farm in east Galway where his father was a skilled carpenter and the hurley maker of the title. We’ll talk to the author about what went into the book and how he swapped the sawmills for the schoolroom and a career as a teacher. Award-winning designer Brian Burke talks about War & Peace, his garden for GOALwhich will be showing at Bloom 2016 and has been inspired by the Syrian conflict. Folks will know Alison Cowzer as one of the people running the rule over pitches on Dragons’ Den. We talk to Alison about her own work in the food sector and some of the investments she wishes she had made in her career. Ear to the Ground is the go-to TV show for anyone interested in rural and farming affairs. The show’s presenter Darragh McCullough, who is also deputy editor of the Irish Independent’s Farming supplement and runs a mixed farm in Co Meath, talks about what goes into the show and how it covers its beat. Rashers, sausages, dairy products, pork chops, bread, fruit and veg: these were just some of the food stuffs which presenter Philip Boucher-Hayes and producer Suzanne Campbell investigated for their RTE series What Are You Eating? earlier this year. They tell us about what we’re really eating – and if we really want to know. New technology is helping Irish farmers get the job done quicker and better than ever before. We hear from Steve Lock from Grassometer and John Larkin from Moocallabout their products, the reaction from the farming community and their plans for the future. One third of Ireland’s bee species are threatened with extinction because we have reduced where they can nest and the amount of food our landscape provides for them. Erin Tiedeken from the All-Ireland Pollinator Plan talks about the efforts being made to ensure bees can survive and thrive. Peter McVerry has been working with the young homeless of this city for more than 30 years. He joins us to talk about his work and what he makes of the government plans and actions to help those in need. Social farming is the growing practice of offering activity on family farms as a form of social support for people to improve their health, well-being and self-esteem. Co Cavan farmer and gardener Barry Kavanagh is one of those involved in social farming and he tells us about what’s involved. Tickets for Bloom 2016 are on sale here.